Dubai, UAE, August 26, 2018: With not long to go before it’s time to wave off the youngsters of the family as they start their new academic school year, chances are your thoughts will have turned to getting organised and equipped ready for the exciting new school year ahead. You may have already purchased your shiny new backpacks, pencil cases, stationary and lunch bags, all from Mumzworld.com’s selection of over 200,000 products and 10,000 exclusives back to school products of course! BUT, for an extensive, great-value, tech-friendly range of items to support your child’s at-school and home learning, you need look no further than Mumzworld.com. 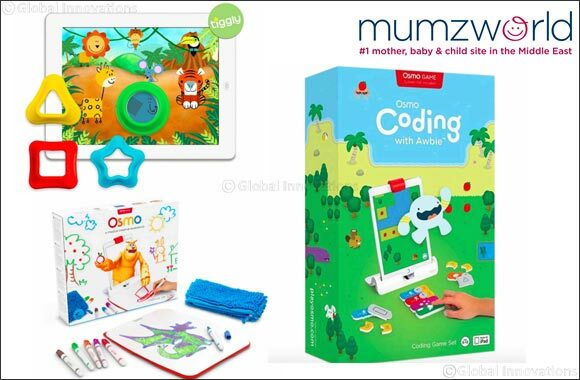 From coding-friendly robots to practical but fun USB’s and digital camera watches, Mumzworld have everything you could need, with the largest selection of over 10,000 exclusive back to school products, the best prices guaranteed and shipped within 24 hours all at the convenient click of a button. Apple iPads, laptops and accessories are all readily available alongside headphones, speakers and interactive educational toys to suit all age groups. Tiggly Shapes are rubberized, durable toys (circle, square, triangle, star) that children between 18 months and 4 years old can use for making learning and play fun with an iPad and three different Tiggly apps. The Shapes have a soft plastic cover and silicon touch points and are durable enough for toddler play—yet gentle enough for iPad screens. They are perfect for encouraging creative and critical thinking as well as developing motor skills. The Osmo Coding Set enhances the way your child thinks and allows them to bring out the best version of themselves by engaging their creativity. The solid blocks combined with the interactive nature of this game help to boost a child's imagination and build confidence. The coding set is compatible with iPad Pro 9.7 inch, all iPad Mini, all iPad Air, all iPad 2 and up. Introduce your child to coding in a reasonably easy manner by using Coding Awbie where multiple kids can play together. The Osmo Creative Set combines classic creative tools, games and cutting-edge technology to foster creativity and problem-solving skills. It is the perfect upgrade for 3 amazing games; Monster, Newton and Masterpiece. Suitable for 5-12 year olds, the Osmo Creative Kit works with iPad Pro 9.7 and 10.5 inch, all iPad Minis and Airs, and iPad 2 and up. Mumzworld currently ships to more than 20 countries and offers fast, seamless delivery across the region within 24 hours, ensuring mums receive best in class service and a convenient shopping experience wherever they are in the MENA region.